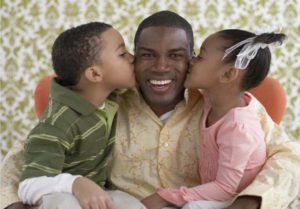 While it’s easy to dwell on the negative side effects of divorce, Father’s Day is a time to reflect on positive effects a father has on children of divorce. Fathers are one of the two most important people in a child’s life, so taking Father’s Day to appreciate the impact they have in a child’s life is incredibly important. Aside from celebrating dad, use Father’s Day to see the benefit of a father’s impact in a child of divorce’s life. Fathers, like mothers, help their children grow up to become well-rounded, moral, kind, and compassionate adults, and realizing this important fact could make co-parenting much easier on both the parents and the children. Father’s Day is a day of celebration, reflection, and appreciation. A father’s relationship with his children following divorce may create an additional protective factor for children. Fathers who are greatly involved in the lives of their children tend to be supportive, set limits, practice effective discipline, communicate at a personal level, and help with homework. As a result, these children tend to have higher academic performance, higher grade completion and income, higher math competence in girls and increased verbal strength in both boys and girls (Anguiano, 2004 and Menning, 2002,2006), a more positive adjustment, and fewer acting-out or internalizing problems (depression, withdrawal and anxiety) than children with less paternal involvement (Amato & Gilbreth, 1999). According to Amato (2000), Carlson (2006), and Menning, (2006) the quality of relationship and type of activities shared between the child and a nonresidential parent (generally the father) is a better predictor of adjustment and good academics. The amount of time, as well as the time period shared between father and children, controls the opportunities for the type of father-child interactions. For instance, fathers who enjoy over-night care get the experience of engaging in warm and nurturing activities such as the ability to feed, bathe, and participate in a bedtime routine. These fathers are more aware of the day to day activities that their children are involved in and therefore the children feel a deeper emotional connection with them. The child’s emotional security and quality of the father-child relationship is determined by the interactions and fathers’ responsiveness to their children (Amato, 2000; Carlson, 2006; Fabricius et al, 2012, Menning, 2006). Children of divorce appear to desire a continuing relationship with their fathers. Reports consistently find that the main complaint expressed by children is the loss of regular contact with their father (Kelly, 1993). Children of divorce usually want additional time and longer contact with the non-residential parent. Reported findings by Peterson and Zill (1986), and Wallerstein and Kelly (1980) found continued contact with competent fathers to be associated with improved psychological scores, fewer behavioral problems, and better peer relationships. In addition, children with continued relationships with their father tend to have reduced contact with the juvenile justice system, delayed initial sexual activity and reduced teenage pregnancy, less reliance on aggressive conflict resolutions, show increased frustration and stress tolerance, greater empathy and moral sensitivity as well as a reduced rate of divorce. Fathers enhance a child’s life by providing economic resourses, emotional support, guidance and supervision. As you can see, the impact a father has on a child of divorce is almost too great to put into words. So while Father’s Day may seem to be a ceremonial holiday, it can be a great opportunity to reflect on the paternal relationship your children currently have, and will continue to develop as they grow older and wiser. Reflect on how your children will be better individuals because they will have had the opportunity to receive parenting from not one parent, but two great parents who not only work together, but appreciate the impact they have in their children’s lives.